ATLANTA, Feb. 12, 2019 /PRNewswire/ -- ZENZII announces that Macy's, Inc. is now their newest retail partner and will be selling a select assortment of their accessories in over 130 full-line stores. ZENZII, known for its fashion jewelry that combines statement styles with high quality materials, has partnered with Macy's to offer a variety of exceptional spring pieces. ZENZII is an exemplary leader in the fashion jewelry industry with its ability to create countless modern and classic styles with higher quality materials and competitive pricing. Shawn Li, ZENZII's CEO, said, "Our new partnership is a great way to provide our high-quality styles to the value-driven customers of Macy's. Macy's focus on a seamless shopping experience and dedication to building trusting relationships with their customers are qualities we not only respect but proudly share as well. We are excited to offer our fashionable, high-quality jewelry to the Macy's customer." 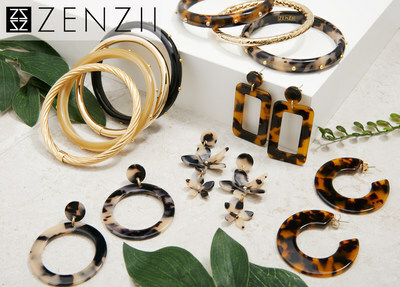 ZENZII and Macy's new partnership will introduce ZENZII's premium tortoiseshell print styles, signature hand-painted flowers, dainty crystal earrings, and many more. Alongside popular favorites, exclusive Spring 2019 designs and colors will also be introduced and available for purchase. Styles to anticipate vary from statement earrings to versatile bracelets for layering. Prices of the collection range from $20-$40. ZENZII is a wholesale and newly launched online retail seller of fashion forward jewelry with a focus on providing quality jewelry at great values. ZENZII has financial interest in all its international factories, giving it more control of the process, design, quality and ensures ethical treatment of workers. ZENZII focuses on organic growth and maintaining its financial independence. It is free from investors that put profit over customer service. Macy's, the largest retail brand of Macy's, Inc. (NYSE: M) delivers fashion and affordable luxury to customers at approximately 670 locations in 45 states, the District of Columbia, Puerto Rico and Guam, as well as to customers in the U.S. and more than 100 international destinations through its leading online store at macys.com. Via its stores, e-commerce site, mobile and social platforms, Macy's offers distinctive assortments including the most desired family of exclusive and fashion brands for him, her and home. Macy's is known for such epic events as Macy's 4th of July Fireworks and the Macy's Thanksgiving Day Parade, as well as spectacular fashion shows, culinary events, flower shows and celebrity appearances. Macy's flagship stores – including Herald Square in New York City, Union Square in San Francisco, State Street in Chicago, and Dadeland in Miami and South Coast Plaza in southern California – are known internationally and are leading destinations for visitors. Building on a more than 150-year tradition, and with the collective support of customers and employees, Macy's helps strengthen communities by supporting local and national charities giving more than $54 million each year, plus 180,000 hours of volunteer service, to help make a difference in the lives of its customers. For Macy's media materials, including images and contacts, please visit its online pressroom at macys.com/pressroom. 04/12 MACY'S : Advanced consulting inc will in-house finance 600 beach front units in ..
04/10 MACY'S : Macy's Launches STORY, The Narrative-Driven Retail Experience in 36 Sto..
04/08 SEARS : DBRS Confirms All Classes of Morgan Stanley Capital I Trust, Series 2007..